Seems the latest craze is to target children with interactive gadgets and toys. When it comes to interactive tamagotchi style smart watches, the market leader has been Leap Frog with their LeapBand™ products line until Los Angeles based team Joyray Tech launched a kickstarter campaign for the child focused interactive smartwatch project Jumpy. Interactive toys are great to make children active; utilizing accelerometer technology that is flooding the wearable market. However, the success of protects comes down to keeping the toy interesting enough so they don't get put shelved once the initial buzz wears off. As they state themselves; there are a lot of wearables for kids - what makes them different? 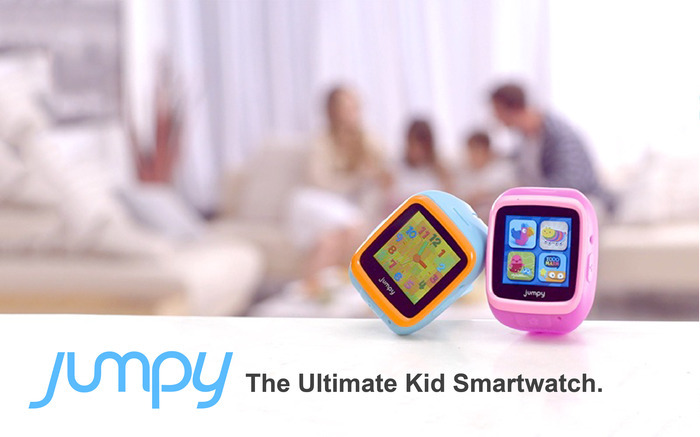 JUMPY is a smart watch specifically designed for kids that promotes healthy lifestyle and creative thinking. I hope their marketing person gets fired for such a vague statement - nothing new here! They definitely need to work on their opening line - thankfully, I kept reading their campaign page and passing over the obvious (kid centric, cool factor - a must with these) I find a little set of functionality that makes the product potentially worthwhile, but a risk as well. Having a detachable and stand-alone smart module that serves as the heart and soul of JUMPY, the core unit is just like the ARK Reactor of IRON MAN. By removing it from the wristband, kids can use it to play compatible interactive games or apps with their parents on iPads. On their campaign video they explain how they can use the stand-alone smart module as an "X-ray" device interacting with a companion mobile device (iOS or Android) - of course, as a developer I am very curious to see see how they provide such an API for developers to provide such functionality. How long before the child misplaces the stand-alone unit? The device also provides messaging (with drawing support), guardian support where parents can monitor their child location and activity history - complete with a decent looking parental interface (in video) to get a good overview of activity and history of interaction. The team is half way through reaching their funding goal of $100,000 USD - with plenty of time to go so there is ample opportunity to support them if you want early access to the unit. I would personally hold off to see how some of the initial versions come out and see what level of support third party developers integrate with them and how it lives up to it's promises to be unique so it doesn't end up being a direct competitor to the LeapFrog™.